For more than 100 years, the Order of the Arrow, or "OA" — also referred to as Scouting's National Honor Society — has recognized Scouts and leaders who best exemplify the Scout Oath and Law in their daily lives. 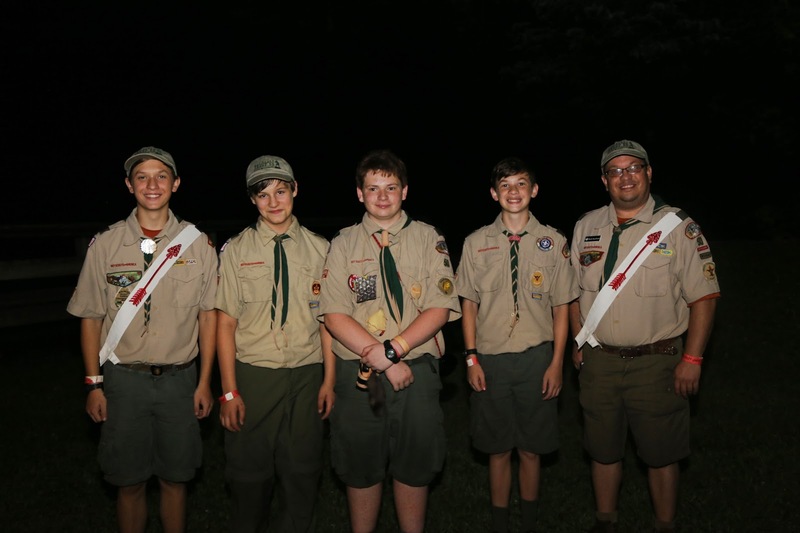 Arrowmen, as members of the Order of the Arrow are know, are regarded for maintaining camping traditions and spirit, promoting year-round and long-term resident camping, and providing cheerful service to others. The troop hosted an Order of the Arrow election at its spring court of honor, where candidates for OA membership were considered for election by all members of the troop. 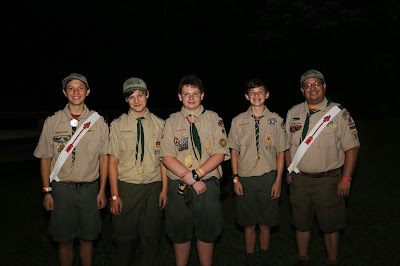 The OA is unique in that nonmembers are often the ones that elect Scouts in their troop for membership. Scouts elected for the Order of the Arrow were "called out" in a number of conventional and unconventional ways. 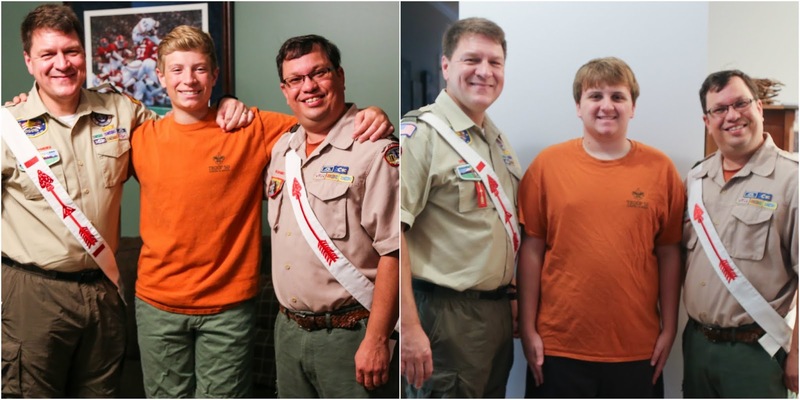 Trey, Joe and Paul, who attended summer camp at Camp Sequoyah, were called out in the conventional manner, along with other campers who had been selected by their troops for OA membership. 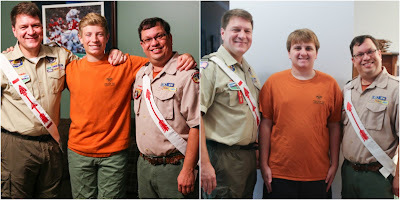 (left) Andrew Stanford, assistant scoutmaster, and (right) Rob Stanford, troop committee chair. Scouts not attending summer camp, however, presented the troop with the need to develop less-conventional ways of recognizing their election. On Saturday, June 24, with Krispy Kreme donuts in hand, Chartered Organization Representative Michael Tullier and Troop Committee Chair Rob Stanford did the OA version of the Publisher's Clearinghouse home visits by notifying Rusty (left) and Michael (right) of their election to the Order of the Arrow. The final two OA candidates — Josh and Creighton, — learned of their election during their 12-day backpacking excursion at Philmont National Scout Ranch in late June. During the weekend of Aug. 4-6, the elected Scouts, along with Assistant Scoutmaster Christian Dagg, who had been selected for OA membership by the troop committee, participated in the Order of the Arrow's induction weekend, called an Ordeal, at Camp Frank G. Lumpkin in LaGrange. 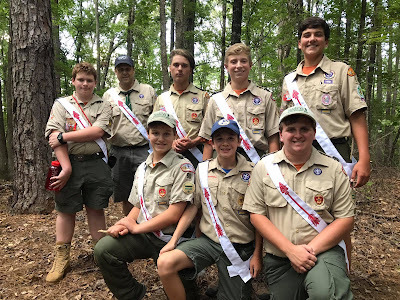 At the end of the weekend's activities, they were inducted into the Order of the Arrow's Chattahoochee Lodge, which is affiliated with the Chattahoochee Council. (back row, left to right): Paul, Christian Dagg, Josh, Rusty and Creighton.